What do you call 25 of the world’s finest automobiles, representing a collective 12,885HP and worth a staggering $67 million? The Pinnacle Portfolio. Yesterday, at Monterey Car Week, this smashed a ton of records when it went under the hammer. Here are some of the favorites. 001, as in the first one produced. Despite it’s birthdate, it’s never really been used. Only 764 on the odometer, none of them under the control of the high speed key. According to Alexander Weaver, a specialist with RM Auctions, they’ve gone over this puppy with a fine-tooth comb, making sure it’s still in pristine condition, though the new owner gets a two-year warranty. And a tour of the production facility. Also included? The 001 license plate. If you own the first, you might as well own the last, too. Hence why the anonymous buyer snapped up the last of the only 300 Veyron coupes ever built — and one of only eight Super Sport editions. With 1,200HP, it can go 258 miles per hour, but it’s only driven 308 miles in its life. Bugatti liked this ride so much, they borrowed it — and 001 — for the Geneva Motor Show. Fun fact: it comes with a complementary set of Michelin tires. Sold for: It didn’t. Bidding never reached the reserve of $13,250,000. This is the orange horrorshow up at the top of this post. And this is what the view is from the driver’s seat. Yes, that’s a satnav on your left, though who cares about the luxurious McLaren interior when you’ve got an LM-spec, road-legal F1 power plant behind you? (One of only two, mind you). Famous for its three seats, rumor has it a prior owner once fit three dates and himself in here simultaneously. Sold for: $13,750,000, a world record. Only five of these Swedish supercars have reached US soil. If it looks oddly familiar, that’s because this exact car was used in the fifth installment of The Fast and the Furious. Michelin brought this stunner to SEMA to showcase, which is where the collection’s mystery owner first spied it during a private preview of the show. Once the dihedral synchro-helix doors twisted open, he was sold and it soon became his. This is another member of the Under 500 Club; it’s only done 441 miles. It’s got two of the best logos you can see on a high performance machine. Don’t call it orange. 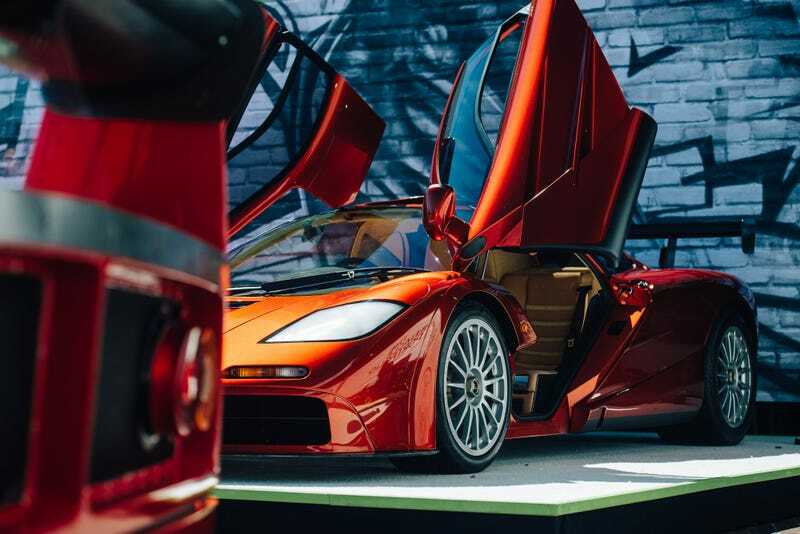 That’s technically Beryllium Orange, and that color is proprietary to Saleen. Eagle-eyed readers will recall seeing this very number lurking around Tony Stark’s garage in Iron Man, because Tony had very good taste. It’s one of two Saleen S7s upgraded to produce 1,000HP. According to Weaver, it does nothing badly. “The turbos kicking in is like jumping to warp speed,” he says, adding there’s a serious punch when you romp on it. There are a total of 57 fins across the surface of the car. I counted. This thing is part shark. This is one of 29, though by this point you’ve probably guessed these are all part of a very limited subset. What really sets these 300SLs apart from their regular counterparts is their aluminum-alloy bodies, though they also came stock with a Sonderteile motor, Rudge wheels, and a sportier, more agile suspension. And luggage. Look at that freaking luggage. Just look at it. Sold for: It didn’t. The reserve of $4,500,000 was never reached. These next few weren’t part of The Pinnacle Portfolio and they’ve yet to be auctioned, but they were still eye-catching. No, it’s not Speed Racer’s car, but it sure does resemble it with those gorgeous swooping lines. Love the minuscule dots of cushioning for the headrests, too. This is the first time one’s come up for sale in more than twenty years. This was among the more visually stunning vehicles. It’s what robber barons would have driven. Immaculately maintained, it’s one of three left on the original chassis. It also just so happens to sit on beautiful 18-inch Michelin tires, treads still fresh to death. Now that you’ve seen what’s happening at Monterey Car Week, it’s time to get in on the action. Enter the sweepstakes and share a photo or video featuring your favorite car-related moment — whether something from your personal history or a historical event — using both the hashtags #MichelinSweeps and #CarWeek. This year, Michelin is giving one grand prize winner an all-expenses-paid trip for 2 to Monterey Car Week 2016. Seven Jalopnik readers will also win a set of MICHELIN® brand passenger or light truck tires. Born from endurance racing, they give you the exhilaration of driving the best performing street tire in the world. Head to michelinsweepstakes.jalopnik.com to see other entries for inspiration. Congratulations to Kevin who won a brand new set of MICHELIN® tires yesterday for his winning #MichelinSweep entry HERE. There’s plenty of time to enter for tomorrow’s giveaway and the grand prize trip for two to Monterey Car Week 2016. And check back tomorrow for more from Monterey. Michelin’s contest rules apply, as well as our standard contest rules. Only open to US residents, 18 and older (19 and older in Alabama and Nebraska). Readers may also enter by sending their contact information to Gawker Media, Attn: Michelin Sweepstakes at Monterey Car Week, 114 Fifth Ave, Second Floor, New York, NY 10011. The contest begins on August 8, 2015 at 11:59 AM ET and ends on August 16, 2015 at 11:59 PM ET. Sean Evans is a writer living in New York who is as shocked as you are that it’s still possible to make a living as a writer. He’s big on all things automotive, whiskey, and heinous reality television. He tweets here and Instagrams here. This post is a sponsored collaboration between Michelin and Studio@Gawker.